Former president of Brazil Lula leads in polls even in jail. April. 17, 2018 08:19. by Sung-Ha Joo zsh75@donga.com. Former President of Brazil Luiz Inacio Lula da Silva, who was arrested on April 7 for corruption charges, still keeps leading in Brazil’s presidential polls despite being in prison, Brazil’s polling institute Datafolha said Sunday. The former president is far ahead of his competitors with 31 percent of the country’s electoral support, down from 37 percent in the previous survey in January but still twice as high as that of his closest rival (15 percent). Sentenced to a 12 year and one month in prison after being found guilty of money laundering and receiving a luxury apartment from a construction company as a bribe in exchange for favoring the firm with public contracts, Lula is likely to be barred from running for the candidacy in October. 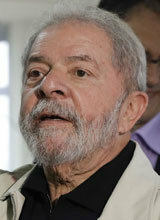 Lula’s high approval ratings are due to his successful implementation of policies while in office pursuing growth and distribution at the same time, receiving widespread support from both the left and right wings. During his term in office, Brazil’s GNI rose by over 20 percent, and around 20 million people escaped from extreme poverty. The country also succeeded in hosting the 2014 World Cup and the 2016 Olympic Games. Such achievements were possible back then because of the constantly rising commodity prices amidst a boom in the global economy. However, the global financial crisis of 2008 brought down the commodity prices, and Brazil was one of the countries hit hard. In response to the crisis, Lula’s successor Dilma Rousseff pushed severe austerity measures that include a drastic cut in the government’s welfare budget. Most people, who once again had to fight hard to make a living, are expecting that former President Lula will be able to put the country back on track towards prosperity.